The Memorial Candle Program has been designed to help offset the costs associated with the hosting this Tribute Website in perpetuity. Through the lighting of a memorial candle, your thoughtful gesture will be recorded in the Book of Memories and the proceeds will go directly towards helping ensure that the family and friends of Ruth Killeen can continue to memorialize, re-visit, interact with each other and enhance this tribute for future generations. Ruth Killeen, Fortified with the Sacraments of Holy Mother Church, on Monday, November 12, 2018 at age of 87. Loving mother of nine, wife of the late Thomas E Killeen III, Survived by eight children--Tom, Kevin (Nancy), Jim (Julie), Ed (Margaret), Mike (Annie), Patty, Dan and Brian (Abbie). A daughter, Katie, died in infancy in 1962, Grandmother of twenty, Great Grandmother of two, Ruth is also survived by a brother Ray (Emily) Newsham, and a sister, Sister Pascaline of the Benedictine order. 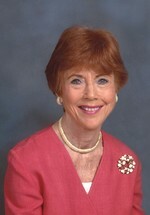 A graduate of Ursuline Academy, Fontbonne College, Ruth was a long-time member of MQP parish. Fondly remembered for encouraging her children's dreams, cooking, baking, singing, dancing, daily walks with hats, prowling garage sales, and ghost-writing Santa's notes that always ended, "share your toys and get along." The family wishes to thank The Dolan House and St. Agnes Home. Visitation Wednesday from 4-8 at Bopp Chapel, Manchester Rd. Funeral 10:00 Thursday morning at Mary Queen of Peace. Burial at Resurrection Cemetery.